My "Editor's hat" is telling me this should really be an entry in the new "The Magic Quest" column, but I figure since I'm only going to cover a small moment in my journey as a Fighting Fantasy fan that I'm okay and won't have to growl at myself for giving it all away on this blog. 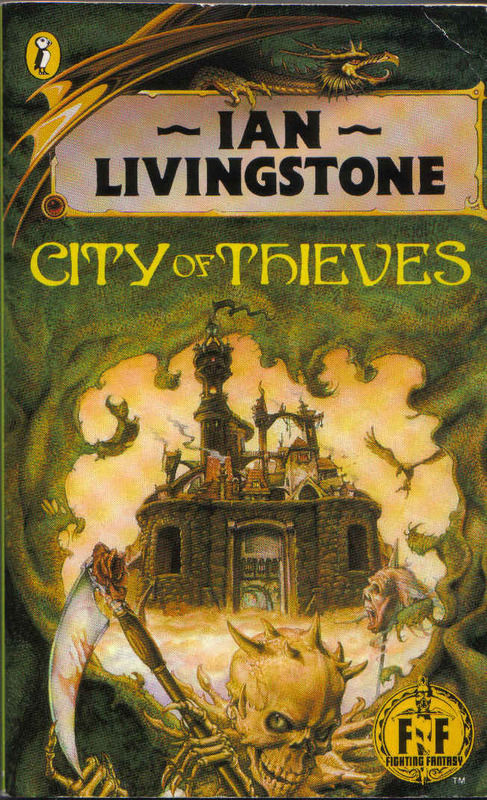 City of Thieves was my first encounter with the Fighting Fantasy series, having been allowed to pluck it from the local bookshop (now a shoe store) shelf in January 1987 for my birthday. Presumably I must have been eyeing up the books before then, otherwise I'm unsure as to why I would have picked the book. 1987 would also be the year I started buying the Target Doctor Who novelisations, but that is a whole different story... Those were great days, with this huge display shelf full of books seemingly aimed at me filled to the brim with Doctor Who, Fighting Fantasy, Lone Wolf etc. So, book in hand, I entered the world of Titan and like so many others was quickly enamoured of the artwork of Iain McCaig. The nubile body of the Serpent Queen had an interesting (!) effect on my young male mind, as did the fetching Vampiress elsewhere in the book, and I spent forever at school scribbling away on pieces of paper fruitlessly trying to replicate McCaig's mastery of skulls (evidence of my failure to master them myself is easily seen in my art for Resurrection of the Dead in issue #1). I assume it is because art so immediately grabs one's attention that I tried my hand at that first, as I don't recall any attempts to pen my own adventures at this stage.